Functioning as the political party of the conservative-right National Vision Movement founded by former prime minister Necmettin Erbakan, the Felicity Party (SP) was established in July 2001. It was formed following the closure of the Virtue Party by the Constitutional Court and is the last political party of the National Vision Movement that earlier founded Welfare, National Salvation and National Order parties. 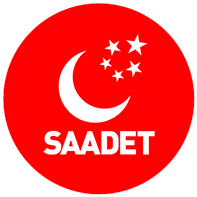 Its emblem is a white crescent and five stars over a red background.